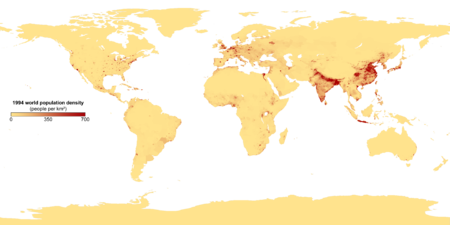 Population density (people per km2) map of the world in 1994. In relation to the equator it is seen that the vast majority of the human population lives in the Northern Hemisphere, which is logical, as 85% of the Earth's land area is there. This population cartogram of the European Union (2007–2012) uses areas and colors to represent population. For humans, population density is the number of people per unit of area, usually quoted per square kilometer or square mile (which may include or exclude, for example, areas of water or glaciers). Commonly this may be calculated for a county, city, country, another territory or the entire world. The world's population is around 7,500,000,000 and Earth's total area (including land and water) is 510,000,000 square kilometers (197,000,000 sq. mi.). 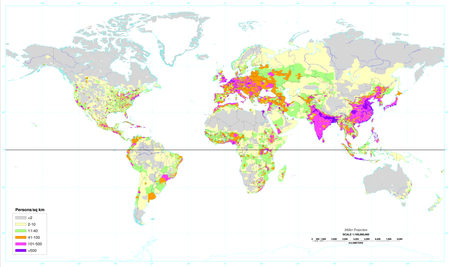 Therefore, the worldwide human population density is around 7,500,000,000 ÷ 510,000,000 = 14.7 per km2 (38 per sq. mi). If only the Earth's land area of 150,000,000 km2 (58,000,000 sq. mi.) is taken into account, then human population density is 50 per km2 (129 per sq. mile). This includes all continental and island land area, including Antarctica. If Antarctica is also excluded, then population density rises to over 55 people per km2 (over 142 per sq. mile). However, over half of the Earth's land mass consists of areas inhospitable to human habitation, such as deserts and high mountains, and population tends to cluster around seaports and fresh-water sources. Thus, this number by itself does not give any helpful measurement of human population density. Several of the most densely populated territories in the world are city-states, microstates and dependencies. These territories have a relatively small area and a high urbanization level, with an economically specialized city population drawing also on rural resources outside the area, illustrating the difference between high population density and overpopulation. The potential to maintain the agricultural aspects of deserts is extremely limited as there is not enough precipitation to support a sustainable land. The population in these areas are extremely low. Therefore, cities in the Middle East, such as Dubai, have been increasing in population and infrastructure growth at a fast pace. The Gaza Strip (exclave of Palestine) has a population of 1.85 million and a population density of 5,046 pop/km. ^ Minimum viable population size. [dead link] Eoearth.org (March 6, 2010). Retrieved on December 10, 2011. ^ Portnov, B. A.; Hare, A. Paul (1999). Desert regions : population, migration, and environment. Springer. ISBN 3540657800. OCLC 41320143.